The Department of Commerce has released a pre-solicitation notice on behalf of the National Oceanic and Atmospheric Administration (NOAA) related to the ProTech Enterprise Operations Domain (Draft RFP). The full notice is available at the official website of Federal Business Opportunities. Each Domain will have a separate solicitation and each of them (solicitations) will result in the award of multiple IDIQ contracts for the specified Domain. This Draft Request for Proposal (Draft RFP: ST-1330-17-RP-0007) is about the Enterprise Operations Domain, one of five support service acquisitions under the Pro-Tech Program. Services required for this domain include “end-to-end solutions for mission performance improvement for NOAA organizations through strategic planning and facilitation related to implementation, coordination, integration, communication, and evaluation of programmatic activities and administrative programs, and management consulting. Furthermore, services also include logistics, financial and business management, facilities and property management, program management, administrative support, conference and exhibit planning, training and education, and human resources services; IT Services needed to meet mission-critical needs are also part of required solutions. The contract will allow more than one pricing arrangement, but with separate contract line item numbers for each pricing management. Task orders are allowed to be issued on Firm Fixed Price (FFP), Cost Reimbursement, Time and Materials (T&M), and Labor Hour (LH) basis. Services are categorized under NAICS Code 541611 – Administrative Management and General Management Consulting Services, with a maximum contract ceiling $3 Billion. Offerors must submit proposals that conform to the solicitation requirements and all specifications. The Government reserves the right not to award a contract depending on the quality of the proposals submitted and the availability of funds. What should Small Businesses know? The ProTech Enterprise Operations Domain multiple award IDIQ contract includes a reserve for small business. According to this DRAFT Solicitation, approximately 75% of the awards will be to small business concerns, including those to the socio-economic categories. The Government intends awarding at least two contracts to Offerors that belong to one of the SBA’s socio-economic categories. Nevertheless, interested participants receiving a marginal or unacceptable rating for any of the three non-price factors identified above shall not be considered for the award. Final Solicitation date release is yet to be announced. 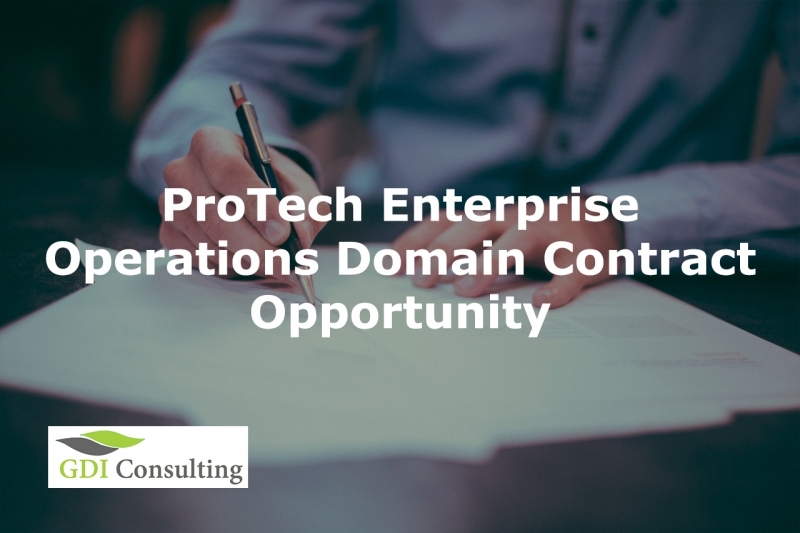 GDIC team is prepared to provide comprehensive support for ProTech Enterprise Operations Domain Offerors. For many years we have helped many businesses win lucrative Federal Contracts and be part of the Government. GDIC is offering the Full proposal development (Only if our audit review tells us that you have a good chance to get awarded). GDIC has years of experience helping prepare over 6,000 proposals. GDIC can provide proposal consultants to fill gaps in your team or a whole proposal team. Please contact MaronFreedy at maron.freedy@gdicwins.com for more information.